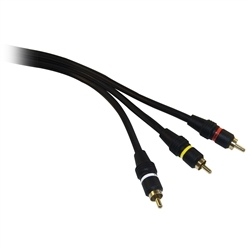 Integrate this high quality 75 foot RCA cable (3x Male to 3x Male) into your audio/video components to amplify sound quality and improve picture quality for a more enjoyable home theater experience. These high quality cables feature much thicker cables than our standard RCAs for improved audio and video signal transfer and less signal interference. The connectors are Gold Plated to prevent corrosion for a long cable life. RCA is a great alternative for audio/video applications where newer connection types are not available.